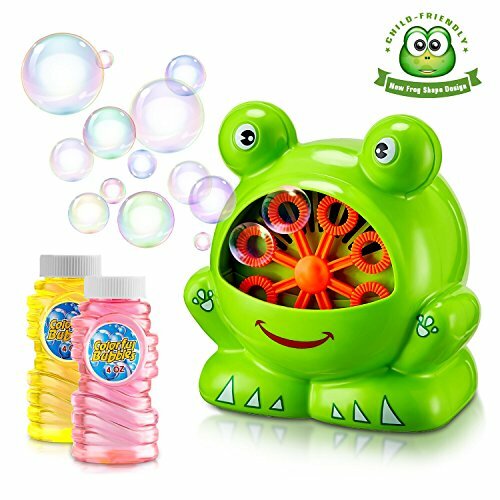 Bubble Machine Automatic Bubble Maker JUST 9.49 SHIPPED! KID-FRIENDLY DESIGN- Fun Frog Shape with bright color, suitable for all children over 3 years old. Portable lightweight design allows children to take anywhere. The automatic bubble machine spits out oodles of bubbles and keeps your kids entertained. It is the best gift and best kids toy. EASY TO OPERATE - After putting in the batteries (not included), you just add the bubble solution (included) and turn on the switch, then you can enjoy the bubbles. A powerful motor and 8 spinning wands bring more than 500 bubbles/minute. SUITABLE FOR ANY SCENE- It is a wonderful design for picnics, birthday parties, barbecues, balls, stages, weddings, etc. It has a flat, supportive pedestal that will sit securely on most surfaces, thus avoiding unnecessary spills and tip-overs. Whether you are celebrating or just want to have fun, this bubble machine will always lighten the mood. SAFE AND DURABLE- The bubble machine is made of non-toxic ABS plastic. At TOSCIDO, we ensure 100% safety of our toys by conforming to the highest industry standards. With strong and high-quality materials, the bubble blower will prove to be durable and long-lasting, so you can buy it once and enjoy for years. WHAT YOU GET- TOSCiDO Bubble Machine, 2*Bubble Solution, Mini Screwdriver, 2*Bubble Wand and our friendly customer service. If you are not satisfied with your purchase for Any Reason, Please Feel Free To Contact Us.